Alas, my friends, I am still very much here, taking nourishment and keeping a keen eye on that pesky, furry cat! Oh how he teases me with his strolls through my royal den, taunting, luring me with his crystal blue eyes. Down the front stairs he comes, effortlessly leaping over the inconvenient blockade placed by my two-legged servants. He pauses, looks, laughing silently as I lay upon the carpet. Step, pause, two steps, pause....oh, you little tomcat......dash to the kitchen on your silent fleeting pads. Run, I do, sort of, through the kitchen but once again, instantly before my arrival he leaps to his escape. We gaze momentarily, then up he goes instantly and lightly as a ballerina to the top of the back staircase while I, once again, am beckoned back to my starting position. Often I hear him run the length of the hallway above only to descend again signaling the game's start. Enjoy your games my friends Snuffles, Annie, Emma, Luna, Buddy, Dizzy, Penney, Tonka, Hope, Trixie, Bella, Zoe, Chief, Sophie and Budro! My earnest wishes for your full recovery Snickers, will be checking in on you. Poor baby in jail. And being taunted by the cat. I really like the Zentangle on the right with the dolphin. Nice design and clever to use the circle to make the little scene. 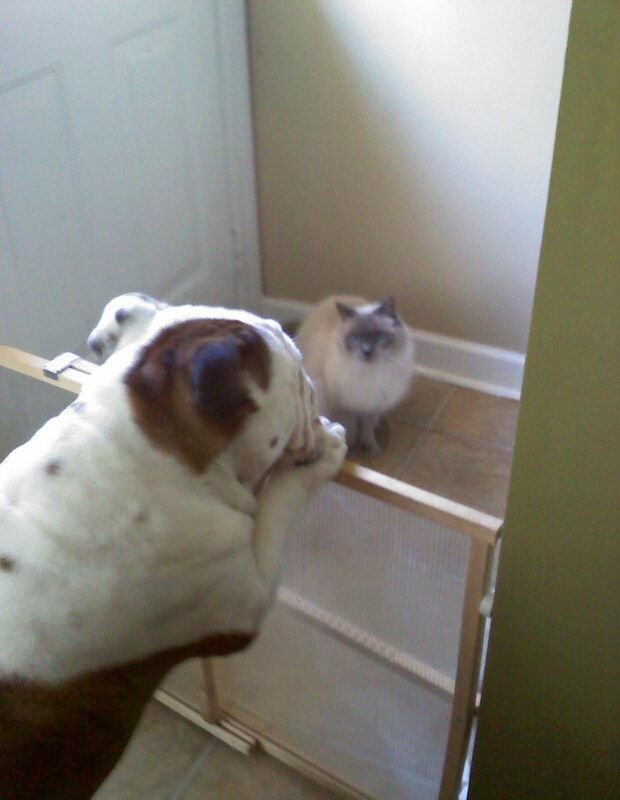 Oh my Appolo, I would get in trouble if I chased an inside cat. I think they are most interesting though. I haven't quite figured out why I am encouraged to chase cats outside yet in the house they are not to be bothered. Hmmm It looks like you might have the same rules. So sad, Apollo. I know how frustrating it must be for you. Alas, I have two cats and NO dogs. But one of my cats got washed today, so you can do a happy dance about that! Well Apollo, who else is going to exercise you in the house?? To cute! Sorry Apollo, but I'm rooting for Dudley!! Since she was recently very ill she has lost a bit of weight. She may be Dudley's twin again one day!